I have tested TCL 43S517 vs 43S405. I had a chance to compare various features of these TV models. TCL 43S517 belongs to the S517 series, while TCL 43S405 is from the S405 series. 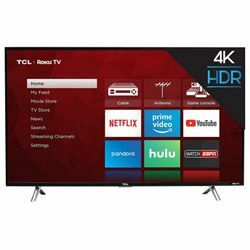 TCL 43S517 is a 2018 year model and TCL 43S405 was released in 2017. Both models belong to the low price category since they cost less than $500. TCL 43S517 uses the Edge LED backlight technology and TCL 43S405 uses the Direct LED technology. Both TVs support the modern 4K Ultra HD resolution. The high refresh rate excludes any motion blurring. Both models support the HDR10 feature, which guarantees a high level of color vividness. Comparing feature of TCL 43S405 vs 43S517, we will see that TCL 43S517 use the Wide Color, the HDR Pro Gamma feature and NBP Photon technologies to make colors richer. It also uses the iPQ engine to control color reproduction. These TVs have powerful processors installed, which guarantee fast responding to your actions. Both models use the TCL Roku TV system, which allows you to access various online services. Both TVs have built-in speakers. These two TVs look alike – they have very stable Y-shaped stands, but you can wall-mount a TV if you want to. The bezel is very narrow and you will not notice it if you sit far from the TV. The dimensions are 37.79x24x8.4 in for TCL 43S517 versus 38.3x24.4x7.5 in for TCL 43S405 (with the stand, which is around 2 in high). Both models are built well, they have 3 HDMI and 1 USB ports, which guarantee a perfect connection. These TVs come with a very simple, functional remote controller, it has fewer buttons than a common controller does, but it is enough to access various menus. Both models are very easy to control. The image is sharp and clear, colors are well-saturated. The display is bright enough. Streaming services work flawlessly – nothing lags or stutters. Great compatibility with various devices – laptops, modern gaming consoles. Plus, it is very responsive. The firmware has the advertisement, which cannot be removed. The built-in speakers are quite weak. The image quality is stunning – colors are vibrant and the image is sharp. This model can handle motion well enough. Great compatibility with various streaming services. Some customers had problems with setting up the TV due to the complex menu. You may find the display too dark (setting brightness higher washes the image out).